WOODLAKE – Someone forgot to remind the Strathmore Spartans they were facing one of the East Sequoia League’s best arms, Robby Stevenson. 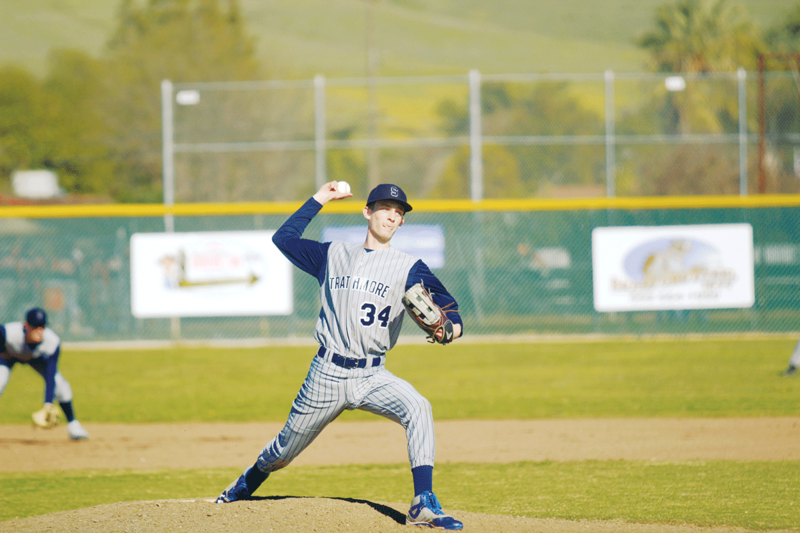 On Thursday, March 14, they took the Tigers’ ace for four runs in the top of the first enroute to their 10-2 win over Woodlake. Strathmore (5-3-1, 2-1) made it look easy by almost making it through their entire lineup in the top of the first. Rigo Alvarez brought home his only RBI of the game when Josue Topete scored from third on his single to right to make it 1-0. Jacob Flores made it 2-0 on the next at bat after scoring on a John Leal ground ball to second. Strathmore added two more runs in the middle of the lineup. Jaylen Oats hit a double to right scoring his only RBI, and Aidan Jackson brought in another on a single back up the middle of the infield. While Strathmore got on the board early in the game, they hung to a close lead 5-2. It wasn’t until after Stevenson was pulled off the mound in the fifth inning that the Spartans were able to open up their lead. Topete came up with two outs and the bases loaded and hit a double to left center field. The hit scored two and gave Strathmore a 7-2 lead. Topete led the Spartans at the plate going 3-5 with two RBIs and scored two runs. Strathmore had a total of 12 hits with William Reece, Flores, and Alvarez joining Topete as the only Spartans to have multiple. Now three games into ESL play Strathmore is in unfamiliar territory as they sit in second place. Their offense has been one part, but their pitching is going to be key for the Spartans remaining in contention. Aiden Jackson got the win for five innings of work where he struck out seven, and only gave up four hits, and two runs. The freshman might have had some nerves at certain moments, but was able to settle them. Woodlake (1-7, 0-3) is at the bottom of the ESL for the second straight season. The talent is there for the Tigers, but just hasn’t been tapped into yet according to first year head coach Chuck Mosley. In this contest it was the Tigers’ fielding which provided some extra chances for the Spartans. Woodlake committed four errors from their young infield. “We do have a lot of work on fundamentals that we need to work on,” Mosley said. Strathmore will have a week off before facing their biggest ESL test this week as they travel to Hanford to play the Sierra Pacific Golden Bears on Thursday at 4 p.m.
Woodlake on the other hand will have no break as they travel to Minarets to play the Mustangs in a non-league contest this Thursday at 4 p.m.